A Drexel University professor known for unfiltered statements on social media that have stirred controversy among conservative media outlets is set to leave the school at the end of the year. 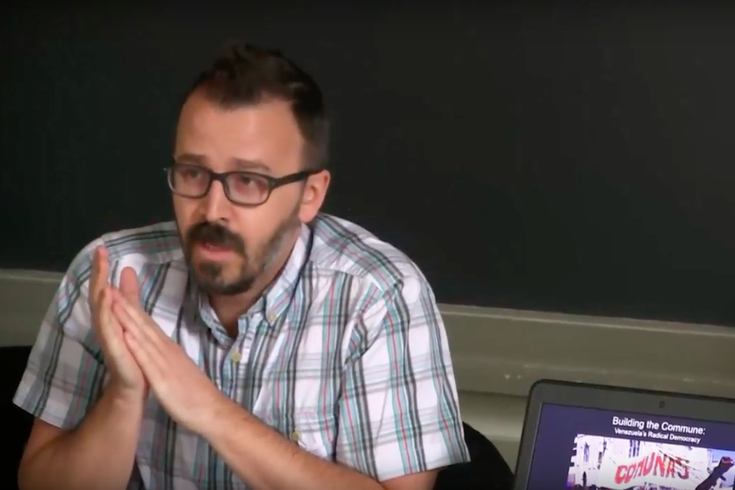 George Ciccariello-Maher, a tenured associate professor of politics and global studies, wrote in a lengthy statement posted to his Facebook and Twitter accounts that he will no longer work at the university after Dec. 31. Referring to a tumultuous year in which he drew wide backlash and even death threats for his social media posts and was placed on administrative leave in October for his protection, he wrote that his "situation has become unsustainable." "This is not a decision I take lightly," he wrote, adding that his situation had become unsustainable "after nearly a year of harassment by right-wing, white supremacist media outlets and internet mobs." Drexel confirmed in a statement that Ciccariello-Maher had resigned from his tenured position. The university placed Ciccariello-Maher on administrative leave in response to threats of violence he received after penning a series of tweets in which he ultimately linked the Oct. 1 massacre of 58 concertgoers in Las Vegas to "Trumpism." Before that, he caused a media uproar with a Christmas Eve tweet in 2016 that read: "All I Want for Christmas is White Genocide." University officials quickly responded to that post, calling it "utterly reprehensible" and "deeply disturbing." He was back in the headlines in March after criticizing a man on Twitter for giving up his first-class plane seat to a uniformed military service member. Ciccariello-Maher said on Thursday that he looks forward to deepening his research, his writing and his political organizing. His statement included messages to faculty members and his students. He also argued that the university communities "must form a common front against the most reprehensible forces in society and refuse to bow to their pressure, intimidation, and threats." "We are at war, and academia is a crucial front in that war," he wrote. "This is why the Right is targeting campuses with thinly veiled provocations disguised as free speech. My case and many others show just how cynical such appeals are, and how little the Right cares about academic freedom." "In the past year, the forces of resurgent white supremacy have tasted blood and are howling for more," he added. "Drexel University has accepted his resignation and recognizes the significant scholarly contributions that Professor Ciccariello-Maher has made to the field of political thought and his service to the Drexel University community as an outstanding classroom teacher. Drexel University wishes Professor Ciccariello-Maher well in his future pursuits." Attempts to reach Ciccariello-Maher on Thursday afternoon were unsuccessful.